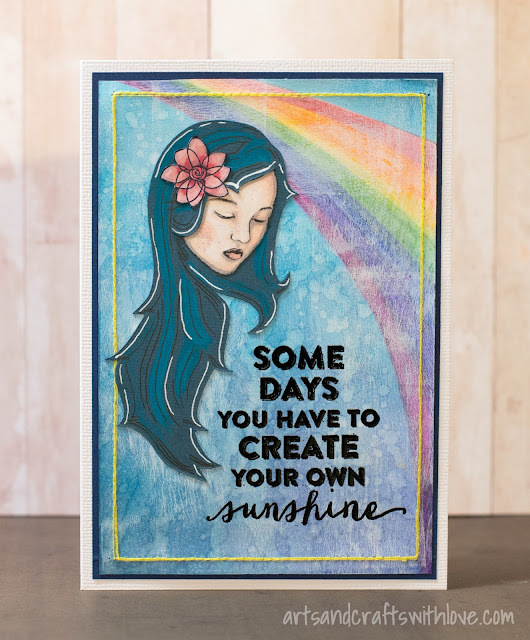 New Mixed Media Card Challenge has started with a beautiful theme: Rainbow! First I drafted the rainbow in the upper corner of the background and cut a matching mask of scrap paper. 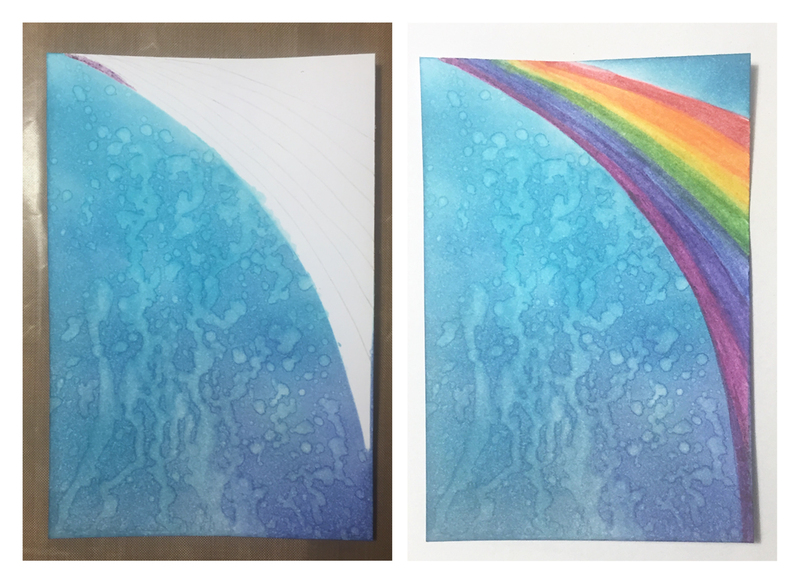 I placed it over the rainbow corner and inked the other parts of the background with a few blue Distress ink colours. Still holding the mask on it's place I splashed water on the inked area creating lighter splash marks. Then I coloured the rainbow stripes with Inktense watercolor pencils, using only a little bit of water to dissolve the pigment. Once dry I white washed the entire background by adding a hint of white acrylic paint with a brayer. 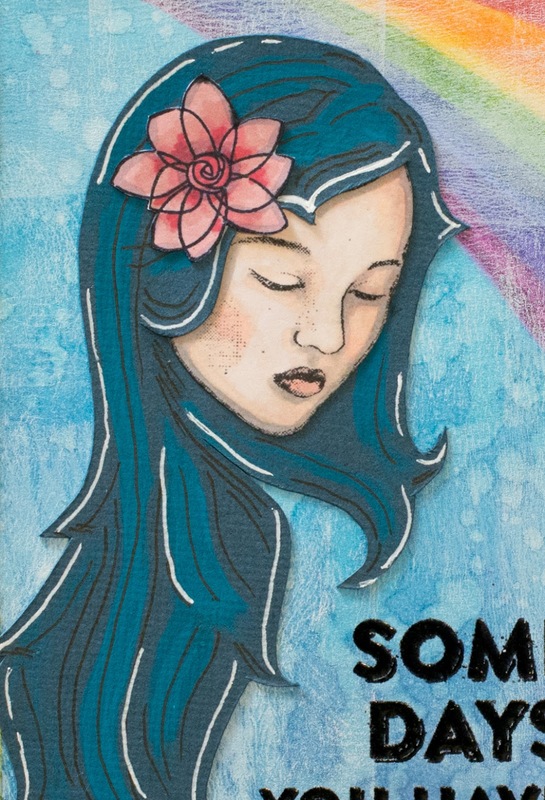 Then I heat embossed the stamped quote text (by Cocoa Daisy) on the card front, and stamped the girl face (by 3rd Eye) on white cardstock. For this purpose I needed the image to be larger, so I removed her original hair and replaced it with my own hand drawn and painted version :) I love creating little collages like that. I hope you get inspired and play along our fun challenge! 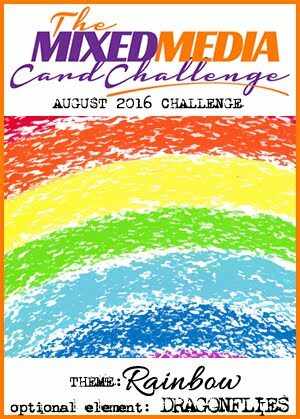 All challenge details and the gorgeous cards by the design team can be viewed here. Wishing you a nice day filled with sunshine! I was hoping you would see this card! Yes, Olivia it is. Love her!